When I write about gun control, I generally make two arguments. First, criminals are lawbreakers, so the notion that they will be disarmed because of gun control is a fantasy. Crooks and thugs who really want a gun will always have access to black-market weapons. Second, to the extent that good people obey bad gun-control laws (and hopefully they won’t), that will encourage more criminal activity since bad people will be less worried about armed resistance. These points are common sense, but they doesn’t seem to convince many leftists, who have a religious-type faith that good intentions will produce good results (they need to read Bastiat!). Every so often, however, the other side accidentally messes up. As part of its never-ending, ideologically driven campaign to undermine gun rights, the New York Times ran a big 5,000-plus word story last month about mass shootings. Creating hostility to guns was the obvious goal of this “news” report. But buried in all that verbiage was a remarkable admission. A big majority of shooters already are in violation of gun laws. The New York Times examined all 130 shootings last year in which four or more people were shot, at least one fatally, and investigators identified at least one attacker. …64 percent of the shootings involved at least one attacker who violated an existing gun law. 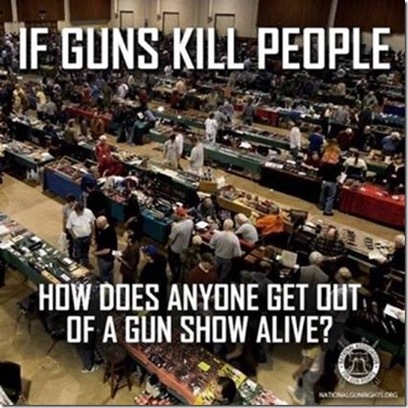 And for the 36 percent of the nutjobs in the story who purchased or obtained guns legally, almost all of them presumably would have gotten their hands on weapons even if they had to violate minor laws on guns prior to violating major laws against murder. So what the New York Times and other anti-second amendment activists are really saying is that honest people should be defenseless even though bad guys always will have the ability to arm themselves. And by making such a preposterous claim, they actually provided ammo (pun intended) for those of us who defend the Second Amendment. P.S. Maybe we should give the New York Times a “Wrong-Way Corrigan Award” for inadvertently helping to make the libertarian case for more freedom! Oh, and give Trevor Noah the Award at the same time. P.P.S. Years ago, I used to post lots of gun-control humor. I’ve gotten out of the habit, but I can’t resist sharing some items that popped into my inbox yesterday. This one of my favorites. And this brought back fond childhood memories. Somehow I avoided becoming a killer even though I grew up watching Yosemite Sam, Elmer Fudd, and other trigger-happy angry white men. 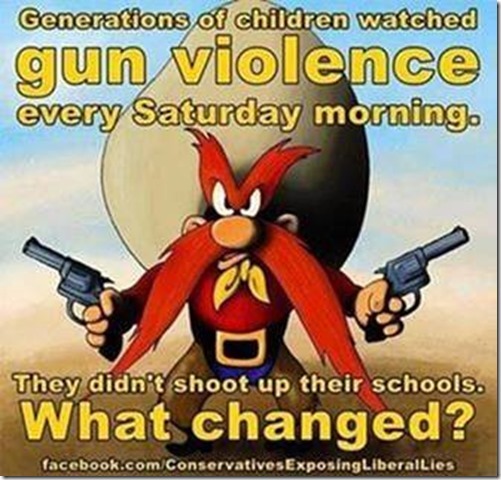 Not to mention shows like Combat and Rat Patrol! Last but not least, this reminds me that crazed mass shooters are always sufficiently un-crazy that they manage to pick out gun-free zones before engaging in their rampages. So maybe, just maybe, the problem isn’t guns. Indeed, perhaps we can draw the conclusion that society will be safer if more good people are armed. Heck, even big-city police chiefs are beginning to reach that conclusions. A commenter Lauren Sheil explains neatly why an attendee is mugged every time there is a computer conference in Toronto, but never in various supposedly rough cities of America. I don’t know anything about Australia but you only have to go as far as Canada to see what common sense gun laws look like, and how they can potentially impact crime. Guns in Canada are for killing moose not defending yourself from criminals or government tyranny. But Dan, you miss the point. The goal of the left is to do an Australia- style thing. Take ALL guns away. Their contention is that if you reduce the number of guns so that ALL guns are illegal, then you dry up the source of these killings. Yeah right. Now if only we could convince them to enforce the gun laws we already have on the books. I sometimes think they purposely do not enforce them in the hope that enough of us will be killed by criminals (who as you point out never follow the law anyway) that we will all eventually see the light. Tell that to the kid who bulldozed and knifed the folks in Ohio, or the terrorists who used airplanes on 9/11. You want to kill somebody, you will find a way.